This is a high quality bag. We needed our bags quickly and we were able to get our bags in time for our event. The entire process was very easy. We will be ordering this bag again. Sweet bags, will definitely be using Custom Earth Promos again. We all should be using recycled reusable bags, they are sturdy and more practical than the stupid use it once and throw it out thin plastic grocery bag. 5 Stars!!!!!! I own a grocery store in texas and we were tired of using the thin plastic grocery bags. So we made the "green" switch to recycled reusable bags. My customers love them and we always receive compliments on them. We will continue to use custom earth promos for all of our reusable bag needs. Where happy we can help play a role in saving the environment as well. Love the laminated finish, we went with the Summer Green color. The graphic artists's at custom earth promos were a pleaseure to work with. We love our bags. Eco-friendly and great craftsmanship of the bag. Our bags are still going strong year later, just placed another order for this year with new design. Love the options for the side panels. They work well with our design/company logo. Great customer service, and they offer a plethora of great products not just recycled reusable bags. I recommend them. These eco-friendly grocery bags have been a really nice product. We love instilling a earth-friendly awareness into our potential clientele. We are in love with our bags! They look fantastic! Just received my bags in the mail and I could not be happier with the end result. Kudos to the Custom Earth staff who meticulously put together my order! So great to finally find a product that is equally functional and attractive! We couldn't be more excited! Really impressed with how our bags turned out. Our logo looks absolutely amazing. These bags are wonderful! Highly functioning and attractive at the same time. These bags make our brand look amazing while we feel good about using an eco-friendly product. Thanks CEP! I love that these bags are laminated. It really provides maximum durability and makes it so easy for us to clean! I use this model at my retail clothing store! We have a couple different versions of the side panel options, all of them look great. Plus the handle size is perfect for shopping! I recommend this bag to any shopper! Very easy to use website. The bags came exactly as I ordered them with the assistance of the staff at Custom Earth Promos. I recommend ordering from this company, very helpful! We have used several of there bags, our customers seem to love the RB10 model the best. We were able to do a custom design that was completely personalized to us. Highly recommend this model. The material is thick and durable. You are able to wipe it clean also. This was a big factor for us being that we hand the bags out at our fresh food farmers market. GREAT CUSTOMER SERVICE, QUALITY PRODUCTS FOR BUSINESS AND ENVIRONMENT. So far I have zero complaints, I would use them again for my next bag order and recommend them. I'm from California where they enforce the use of reusable bags. I think its great I have traveled to a bunch of countries around the world and the U.S is the only one that spoils you with 1-time use plastic bags. As Americans we are very wasteful. The harm those plastic bags do is profound to our landfills, ocean life, the list goes on. It doesn't take much effort to carry your bags into the grocery store with you, fill them up with groceries, take them home then do it again. I love companies like this that support the green movement and spread the awareness for the need to live green and save our home called Earth! Our logo looks great, recycled reusable bags are the way to go for advertising and getting your brand out there!!! 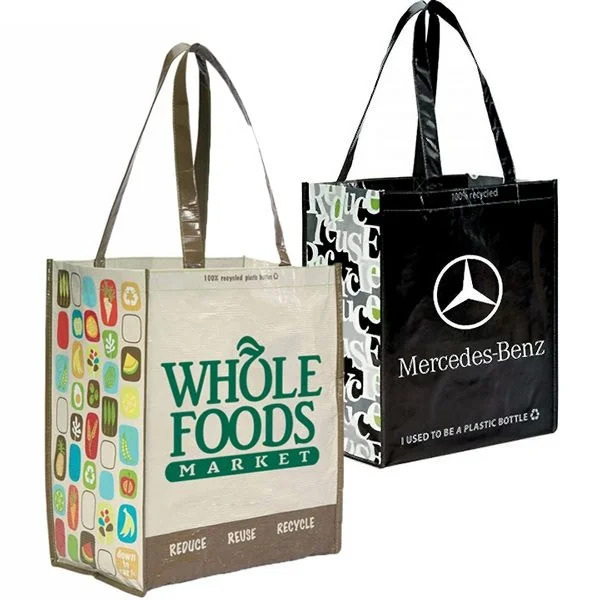 Recycled and laminated for maximum durability, the Eco-Friendly Reusable Grocery Bag from Custom Earth Promos is a strong choice and customer favorite based on its many desirable features. Boasting elegance and obvious eco-credentials, this carry-all always makes your brand look good and encourages your customers to go green. These attractive, functional. eco-friendly bags are available at wholesale prices. They perform well as giveaways at corporate events and make thoughtful gifts for guests at your hotel, spa or anywhere else. Place your order today and watch how well your customers respond from the moment our bags arrive at your workplace. With its generous dimensions and gussets, this fashionable tote is extremely handy, even on your bigger shopping trips. The bag's sizable main compartment effortlessly accommodates multiple items with ease, while its gussets allow for maximum capacity. Equipped with 23.5-inch straps, this handy tote can also be carried around easily and conveniently. Crafted using three recycled plastic bottles, this eco-chic reusable bag makes a big difference to the environment. When you invest in these bags, you are helping to reduce plastic bottle waste in landfills and you’re also doing your bit for energy efficiency (up to &frac23; less energy is needed to manufacture items using RPET). The bag's laminated surfaces add to its overall strength and durability. So you can reuse this low-maintenance carrying solution for a long time and barely worry about its upkeep . Our completely recyclable shopping bags are CPSIA-compliant, so you can rest assured that children can safely use them, too. Our California Proposition 65-compliant bags are just what you need to declare your responsibility to the environment and earn kudos from customers and the general public alike. When you order our recycled Eco-Friendly Reusable Grocery Bags direct overseas, you can pick from a range of custom options. Bag decoration is an important part of your promotional strategy, and you'll certainly want your giveaways to act as walking billboards. To make it happen for you, we have some exciting decoration solutions to offer. Let our talented design team come up with compelling ways to incorporate your logo or advertising message on your bags. Get your design imprinted in a 9" W x 9" H space on the front, back or center panels of the bags. Should you require additional design options, don't hesitate to ask us. When you team up with Custom Earth Promos, you know you’ll get extremely competitive prices. Our international factory is well equipped to handle huge orders in a timely fashion while guaranteeing top-notch product quality. Overseas manufacturing also means that we can keep our costs low, so we can pass the savings on to you.